Firstly, what I’m most proud of: One of my best friends has decided to start a blog on his space. Akismet has protected your site from 30 spam comments. 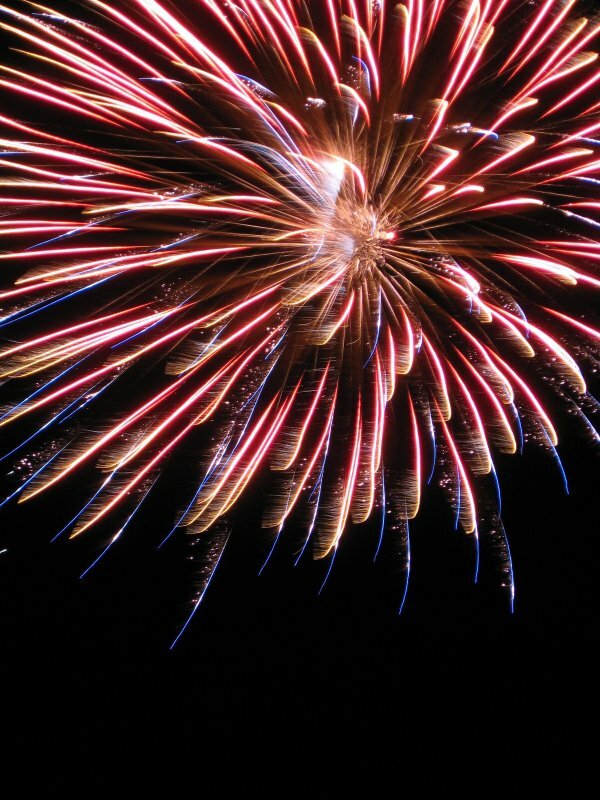 NOTE: The fireworks image is taken from here. Credits go to Charles Kressbach for this great photo. 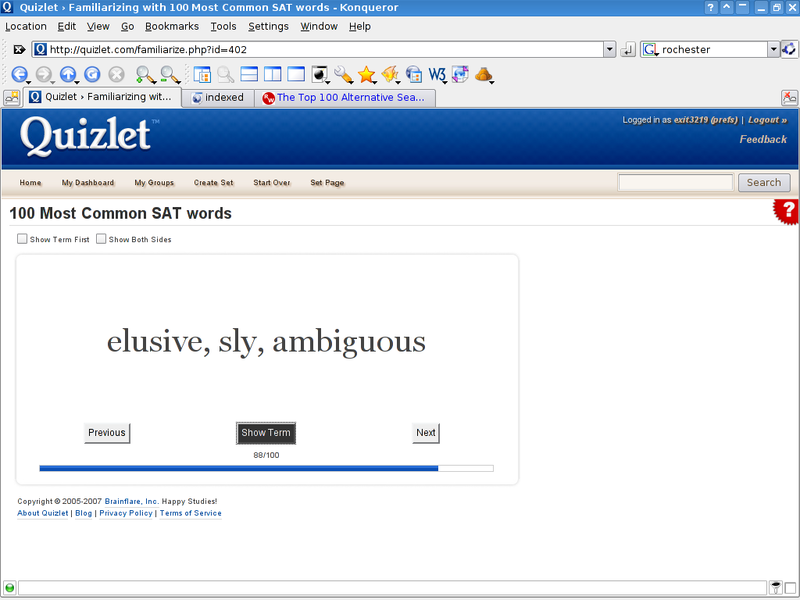 Quizlet.com – The way to learn vocabulary. You can make your own lists of words (not only in English), use other people’s lists, take tests and measure your progress. (And it works in Konqueror, too!) What more could you possibly desire? I want to improve my English so I believe it will prove particularly useful to me. Here’s one for starters: The 100 Most Common SAT Words. Do you think you know half of them? Well, congratulations then. OK, this one will definitely make some Linux gurus laugh at me. I have accidentally removed a directory with some music files I’ve downloaded off emule recently. My /home partition is ext3, so I tried to search for undelete solutions. I have recovered files from NTFS before, so I thought it was possible. Bad luck, it seems. This page says it can’t be done. They make it impossible for security and reliability reasons, if I got it right. It’s a pain to leech 79MB+ of data off emule again, especially with my nearly-dial-up 64k :( I guess I’ll know better next time. Backup!! And look closely before hitting Del! KDE 4 gets one step closer to the Free Integrated Desktop I’ve always dreamt of, with the developing of the Grand Unified Progress Manager :) The link will send you to the Dot article and discussion. KDE 3.5.6 is released with new features. Kubuntu users, you’ve got the fresh, rock-solid free desktop environment packaged for immediate download. KDevelop 3.4 gets released as well. With over 500 bugs fixed and a fair bunch of new features, the best free IDE for C/C++ strikes again. And here’s that link again for Kubuntu users. Why? Because it has been in my pocket for almost a full day, with the HOLD switch on. And in the evening, when I wanted to listen some Leaves’ Eyes, bummer. The hold switch moves freely, but doesn’t disable the hold function (meaning: I can’t start the player). Was that to be expected, after less than a year of use? I’d like to tell you the chipset and battery manufacturer and other useful stuff, so maybe we can hack the firmware etc., but I didn’t go that far. 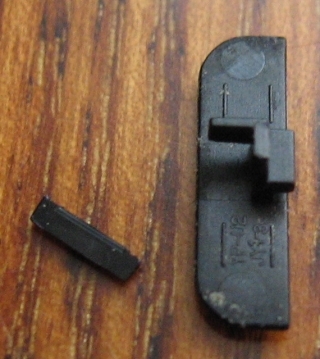 I took it apart only “deep” enough to move the hold switch back to “unlocked”. You can see the tiny switch on the left picture (under the LCD, to the right, blue color). If only I had the source of the firmware, so I can kill bugs and add features, or at least the tools to build my own from scratch. Samsung, are you listening?!! Yesterday was an amazingly productive day. I solved a USACO problem at school, a infoarena problem at home, and got a “perfect” idea for a .Campion problem later in the evening. Apart from that, I found enough time to watch the Idiocracy(.avi) movie (a stupid one, really, *so* USA-centric). “Writing Solid Code” taught me to use asserts. world.e: world6-0rc1.cpp:666: int LuckMoneyAndShit(int, int): Assertion `isFair(&theWorld)' failed. Just found a great new funny website: bash.org. You are currently browsing the exit's /dev/urandom blog blog archives for January, 2007.